Imagine that someone wants to build a parking lot in the middle of the Quad. Consider the issues that it would raise. Where would students throw Frisbees or spread their blankets on a beautiful spring day? What about traffic safety? Do we really need more on-campus parking? 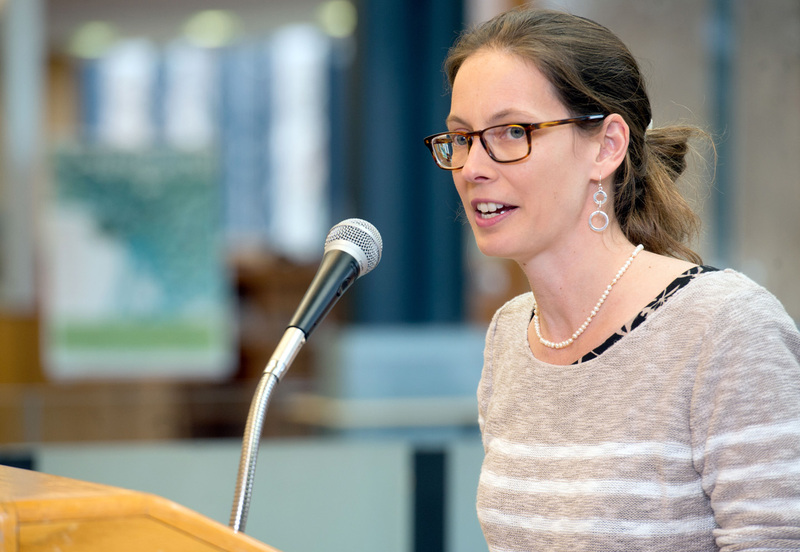 Professor Caroline Lee speaks at Skillman Library. A public engagement consultant would invite a cross-section of the public to weigh in on the matter: those in favor, those opposed, and those in-between. This is something that has become recently popular: town hall meetings. From there, it is presumed that a more informed decision could be made and the public would be satisfied with the results. In real life, sometimes this happens, sometimes it doesn’t. Caroline Lee, associate professor of anthropology and sociology, investigates the current version of democracy in America in her new book, Do It Yourself Democracy, a democracy in which average citizens are invited to “join the conversation” and “do their part” to address social issues and participate in political change. This is called dialogue and deliberative (as in, to deliberate, to consult or confer formally) democracy. 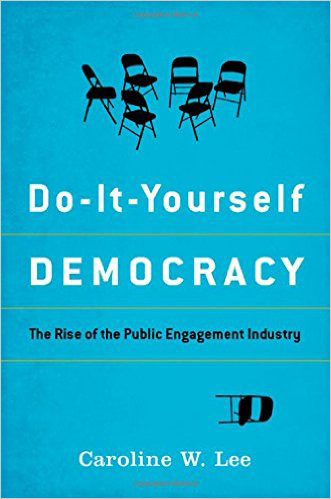 Lee’s research in the public engagement industry examines how and why these varying results happen, how these political processes are continually changing, and what they reveal about the landscape of American politics. In the Feb. 6 issue of the Philadelphia Inquirer, Lee wrote an Op-Ed piece in which she encouraged debate about sociopolitical and economic issues despite feeling that social change is larger than any individual efforts. These efforts at change must be on a larger scale with a larger stage, as exemplified by protests, such as those in the recent Black Lives Matter movement. How does this translate into the classroom? In her Sociology and American Studies classes, Lee’s teaching centers around research methods. She provides opportunities for students to apply what they’ve learned in the classroom to current events. A small sampling of past student research topics have included new social movements (Occupy Wall St., Tea Party, universal healthcare), an analysis of women’s business self-help books, and an independent study on global movements against sexual assault. Often, she requires that they engage public dialogue themselves. So can deliberative democracy incite real and meaningful social change? Lee acknowledges that individual actions are important and the outcomes are good for the short term –it gives citizens an immediate sense of empowerment and the satisfaction of results they can see— but is it enough to revise the larger social structures in place? What are the effects and consequences of do-it-yourself democracy? These are some of the questions that drive her research.